Hello my stampy friends!! It is the 13th and that means it is time for SNEAK PEEKS at Paper Sweeties. And we have some darling baby stamps coming out on the 15th! Here is a card I made using Bundle of Joy! First, I stamped and paper pieced the little baby pram. I found the perfect little buttons for the wheels! This fun Carta Bella paper was perfect for my little boy card. I added lots of different die cut stars to match the paper. Hope you come back tomorrow and see what else we have to share!!! Check out what my Paper Sweetie Teamies have made using the new releases! They are fabulous!!! Super cute card Mackie! Lovin' all the stitched stars! Darling card with all the stars and sweet baby carriage!!! Mackie this is Gorgeous!! I love how you paper pieced the baby carriage! And great papers and colors too! Love love love this! LOVING those stars!!!! 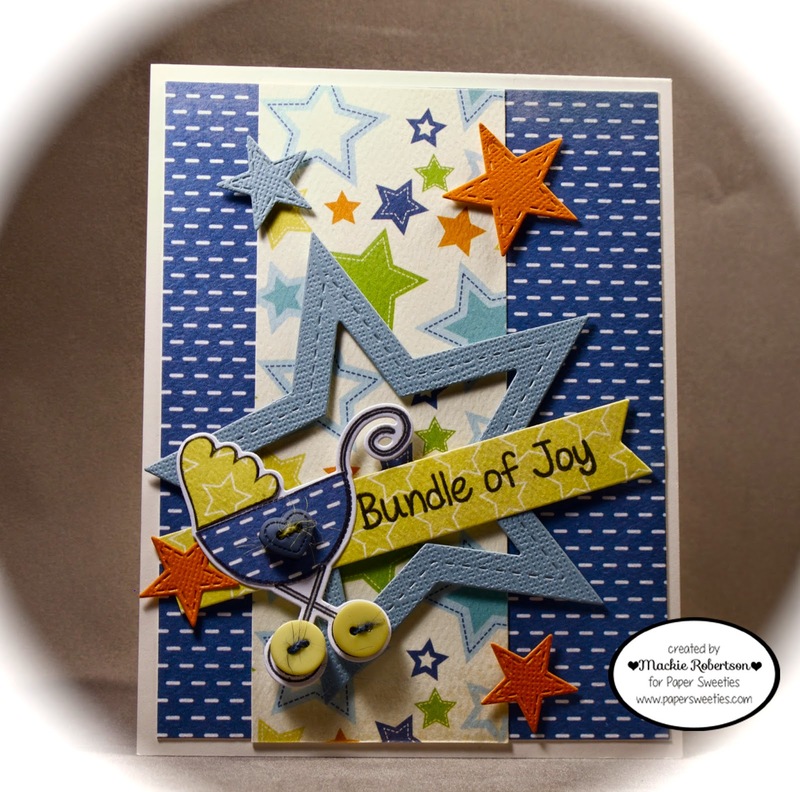 Sweet as can be -- love all the fun elements that come together to make this card wonderful! Mackie, this design is wonderful! Fun mix of pattern papers!